This is one is straight out of Willy Wonka’s sweet imagination. 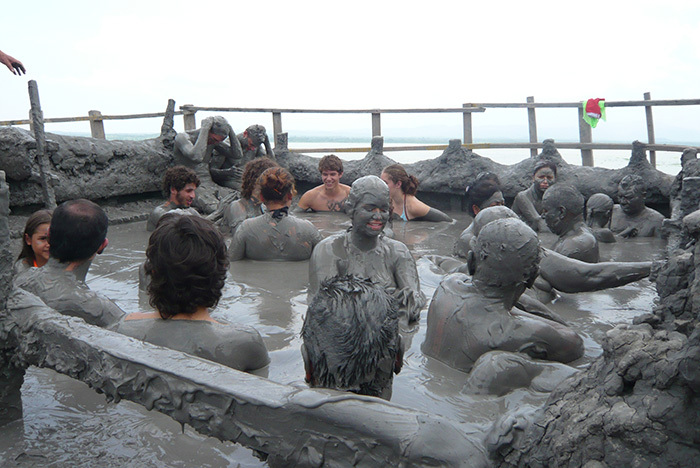 About an hour’s drive outside of Cartagena lies a natural phenomenon known as the Volcan de Lodo El Totumo, a mud volcano with thick, mineral-rich chocolate-textured mud bubbling in its crater. Formed by various geological forces, mud volcanoes are found around the world, free of hot lava, but saturated with sedimentary sludge. There are several volcanoes featured in this book, and Bucket Listers should take great care not to fall into their craters. This particular volcano, on the other hand, wants us to jump right in. Locals have long enjoyed the benefits of El Totumo. Lately the crater has been seeing a lot more foreign bodies, making the journey from the cruise port of Cartagena. First, dispel the image of Mount Doom. This is no lava-crackling cone towering in the distance, shooting gases and molten rock into the sky. 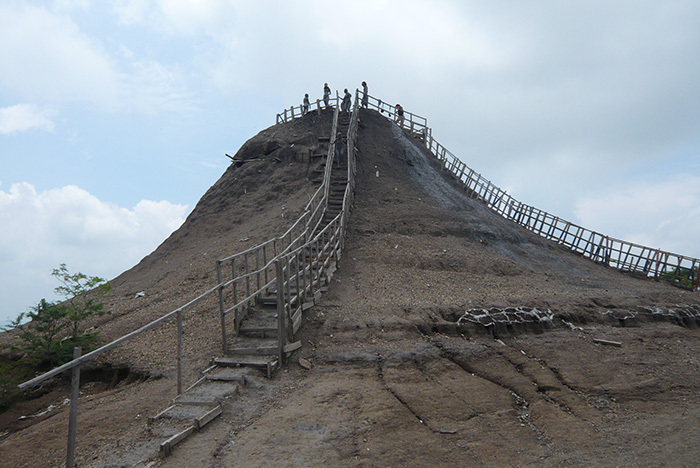 In fact, when you first encounter the Volcan de Lodo El Totumo, it looks like an overgrown termite hill, or a fifteen metre-high pile of elephant dung. More than one Bucket Lister will shake his or her head disappointed, wondering if this is just another tourist scam, a two-bit natural wax museum. Well don’t judge a book by its cover, a volcano by its lava, or a Colombian taxi driver by his choice of car (trust me on that last one). I climb a slippery path to the top, holding onto rickety wooden beams, quickly ascending high enough to gaze across lush tropical vegetation and a tranquil lagoon below. Several thatch huts at the base offer blessed shade from a scorching equatorial sun. Volcan de Lodo is operated by an association from a nearby village, the villagers rotating duties of collecting entrance fees, selling water, offering massages (for tips) or lagoon rinses (for more tips). The crater itself is the size of a small pool, if you can imagine a small pool full of dark, creamy mousse. I arrive early, before the crowds, and a single villager beckons me in. The sun is already beating down hard, so I hang my shirt on the wood, and eagerly immerse myself in the cool, thick slop. I loved Charlie and the Chocolate Factory (the original, not the remake) and I’ve always fantasized about swimming in a pool of milk chocolate. Not anymore. 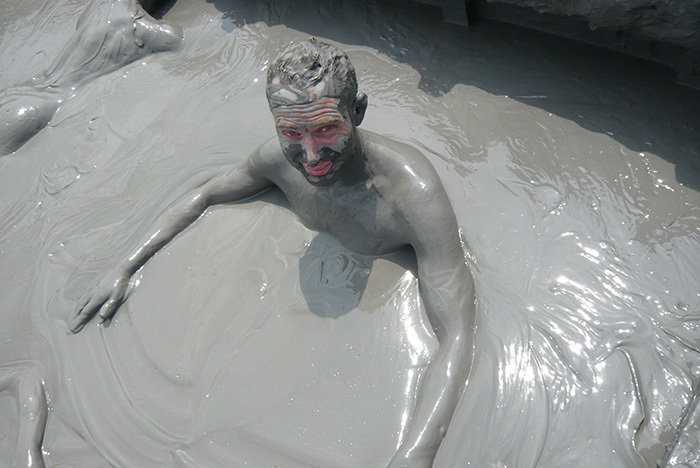 This mud is so thick it suspends my body like a hair gel, comfortably invading my pores with natural mineral goodness. Solid enough to lie back and support my head, the crater is deep enough to stretch out in every direction and relax every muscle in my body. Within seconds I’m a mud creature, the unexposed pink skin around my eyes resembling shortcake in a chocolate pie. A mousse masseuse effortlessly spins me over and roughly exfoliates my back by rubbing his hands up and down. Like most Colombians I have met, he is only too eager to share his culture’s genuine hospitality. Refreshingly cool in the mid-morning sun, the mud envelops my body like liquid black latex. Buses of tourists arrive, and the small crater quickly fills up, a bowl of black-bean soup with floating white potatoes. A splash of mud gets in my eye, but fortunately another villager is on hand to wipe it away with some tissue paper. Tugging on our arms and legs, the masseuse parks us around the crater, making sure everyone gets a spot. After thirty minutes, the mud has sucked up whatever toxins it could find, and I begin to feel lightheaded. Emerging from the silt porridge, I make my way down to the adjacent lagoon where village women await with tin bowls for the messy clean up. My rinse-lady is fearless. She dunks me into the warm lagoon, scrubs me with her hands, and before I know it she’s ripped off my shorts too. Female tourists yelp as they cling to their bikinis for dear life. Within seconds, I’m mud-free and, after awkwardly replacing my shorts beneath the water, emerge from the lagoon with rejuvenated skin glistening in the sunshine. Local legend calls this the “Volcano of Youth”, where a fifty year-old might enter the crater, and leave twenty years younger. Whatever the medical or mythical benefits of this volcano may be, it’s most certainly one for the Global Bucket List.